This latest addition to the ATEM product line provides a whopping 40 12G SDI inputs, 4 DVE’s, 16 keyers, 4 media players, 4 MultiViewers, and standards conversion on each input. If working in 8K, 4 12G quadlinks will represent 1 channel of 8K, meaning that the Constellation will support up to 10 8K inputs. The multiviewers are customizable and it has tally. Simply put, there are a host of features with 8K capability for under $10,000. 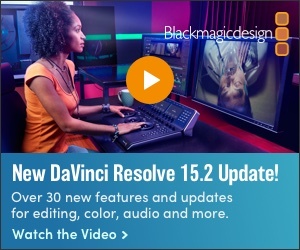 This is another Blackmagic Design product that lowers the cost of production while offering complete feature sets. It has a built in Fairlight audio mixer supporting up to 156 channels of audio. It has full digital as well as analogue inputs for video. This latest HyperDeck will ship in June for $4995. It picks up the feature set of earlier HyperDeck models adding H.265 reading and encoding up to 8k, optional internal cache, and even analog i/o for legacy VTR’s. Blackmagic promotes its use for 8K digital signage since playback is real time. With its quadlink 12G capabilities, it can also record 8K at full resolution. Like prior HyperDecks, it can store to C-Fast2 cards but like recent Blackmagic cameras, it also contains a USB C port to utilise fast and comparatively less expensive SSD media. MultiDock 10G is a companion product to the HyperDeck Extreme 8K allowing up to 4 SSD’s to record HyperDeck content. It can split the input between 2 USB C ports, RAID the drives or simply record to an SSD individually or sequentially. At $595, it is a logical addition to the HyperDeck 8K.